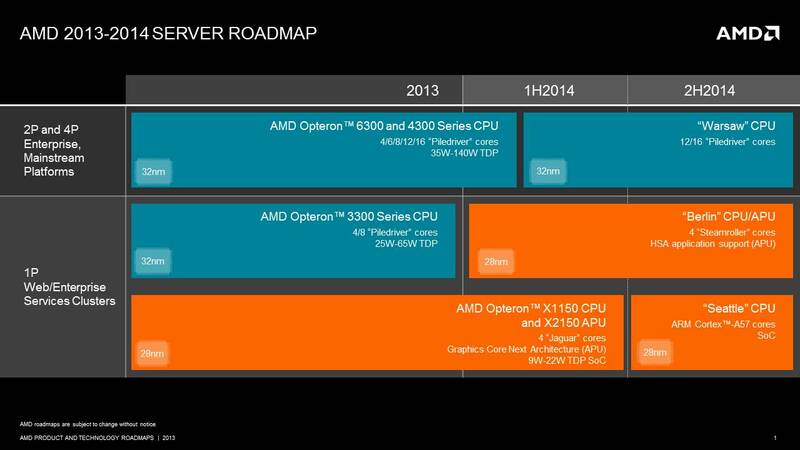 AMD just released their roadmap for the server market covering the end of of 2013 and the first half of 2014. They are proposing three types of products to encompass different types of systems, depending of customers needs. Seattle is a brand new CPU, based on ARM Cortex A-57 core, and will replace the Opteron X-series that have just been released by AMD. The new CPUs will feature up to 16 cores, will be system-on-chips (SoC) and be built on 28nm. Berlin is a bit more interesting for the home user as it all but confirms the Kaveri APU. Berlin server parts will feature four Steamroller cores and it is said to support HSA. It will also be built on 28nm and should show up at the beginning of 2014. Those specifications are in line with the ones of Kaveri APU for desktop and laptops. Kaveri is expected to feature the new Steamroller CPU architecture, the evolution of AMD’s current high-performance core, Piledriver. It is also expected to have a serious update to its graphics processor, with the implementation of GCN architecture featured in Radeon 7000-series graphics. The new APU is expected to hit the market by late 2013 and, it seems, will be followed by the sever part. The most worrisome part of this roadmap is in the high-end of the product range. Here, AMD announces a refresh of Piledriver-based products where the whole world was expecting Steamroller to show up in force. Instead, AMD officially announces Warsaw, a CPU boasting 12 to 16 Piledriver cores, built on the good old 32nm process, a manufacturing node that is already showing its age. AMD having an history of releasing its server part before the consumer part, this piece of news may point to the fact that the new Steamroller desktop processors are not coming anytime soon. Not before the third quarter of 2014 if we’re to believe this. Now it doesn’t make much sense for AMD not to release the Steamroller architecture to the high-performance server market if it’s ready for the APU market? At this point it’s anyone’s guess, but one could think there some more performance/power optimization to be made. So how to AMD Opterons compare to Intel's Xeons? Do Quad Opterons outperform Quad Xeon E7s? I heard that AMD excels generally in multithreaded apps, but do they beat Intel? What about dual vs dual? Is the difference between Xeons/Opterons analogous to the difference between the FX/i5/i7 series? Yes, Opterons are pretty much FX processors, except they put two FX CPUs together to make a 12-16 core Opteron. Same thing goes for Intel. Developing a "big core" CPU costs a lot in R&D, so once it is ready for prime time they try to use it is as many products as possible, from low power to server, with desktop in the middle. That is why we're quite surprised not to see Steamroller architecture in the high-end server market. There must be something wrong. Something wrong or they're just not finished with it yet? AMD has to get this one right and hopefully they're gonna hold it back untill they actually have something competitive. I certainly hope so. The last thing they need is another version of bulldozer. I haven't posted much in a while, but 'Seattle' has game changing potential. That chip also uses the Freedom Fabric that Seamicro developed. AMD bought Seamicro for ~500 million a year ago, this is the first chip that has all the awesomeness on the same die. In my opinion, both Seattle and Berlin are important product releases for AMD. It may allow the company to grab a decent market share in the micro server and small enterprise server markets. Current Kyoto offering is interesting, but as you said, Seattle has all the goodies! It seems as they are forfeiting in the high power server for the time being though, only offering a drop-in upgrade for current socket G34 machines.